687 Say unceasingly the Divine Mercy Chaplet that I have thought you. Whoever will recite it will receive great mercy at the hour of death. Priests will recommend it to sinners as their last hope of salvation. Even if there were a sinner most hardened, if he were to recite this chaplet only once, he would receive grace from My infinite mercy. I desire to grant unimaginable graces to those souls who trust in My mercy. 1541 My daughter, encourage souls to say the Divine Mercy Chaplet which I have given to you. It pleases Me to grant everything they ask of Me by saying the chaplet. When hardened sinners say it, I will fill their souls with peace, and the hour of their death will be a happy one. 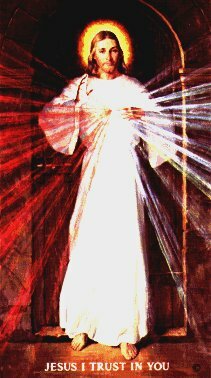 1541 Write that when they say this Divine Mercy Chaplet in the presence of the dying, I will stand between My Father and the dying person, not as the just Judge but as a merciful Saviour. 1731 Through the chaplet you will obtain everything, if what you ask for is compatible with My Will.